The best way to cook bacon with little to no clean up. Sure everyone has tried it in the oven, but have you tried this kitchen hack? 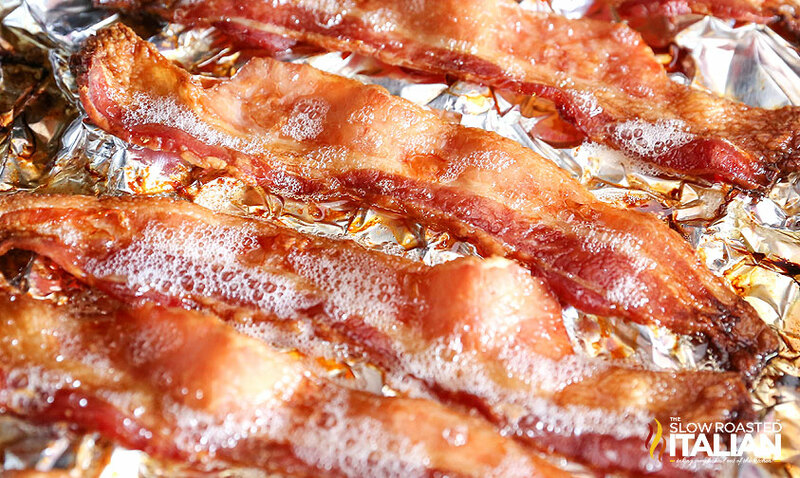 We love bacon around here. I am sure you may have noticed all of the bacon recipes on our site. But, I don't like the mess that cooking bacon on the stove top or even in the microwave create. These 2 new method I am sharing is so much less messy and one of these hacks causes little to no clean up. That is my kinda kitchen tip. My whole family loves bacon, but I don't like the mess. I have cooked it in a skillet on the stove. I have cooked bacon in the microwave with a ton of paper towels and I hear you can even cook it on the grill (although I have never tried). I worked in many (seriously, many) restaurants as a young adult and noticed they weren't making a mess cooking it in a skillet or microwaving it. They cooked it in the oven on baking trays. Since then I have been cooking bacon in the oven (unless it is just 1 or 2 slices). Cover a baking pan with aluminum foil and place an oven safe cross-wire grid cooling rack in the pan. Lay slices of bacon on the pan. Do not overlap the slices or they will not cook properly. Place pan in oven and bake for 15-25 minutes. The length of time will vary based on the thickness of your bacon (thick cut takes longer) and the doneness you prefer. (I like mine crispy). You can cook 2 sheets at the same time, but it will increase your bake time significantly. Switch baking sheets half way though cook time. Gently crumple a large piece of heavy duty aluminum foil causing wrinkles. DO NOT crumple into a little ball. Just squish it together and pull it apart. Lay it across your baking sheet and gently straighten it out. Do NOT smooth it down or you will lose your crumbles. Tuck the edges under the lip of the baking sheet. 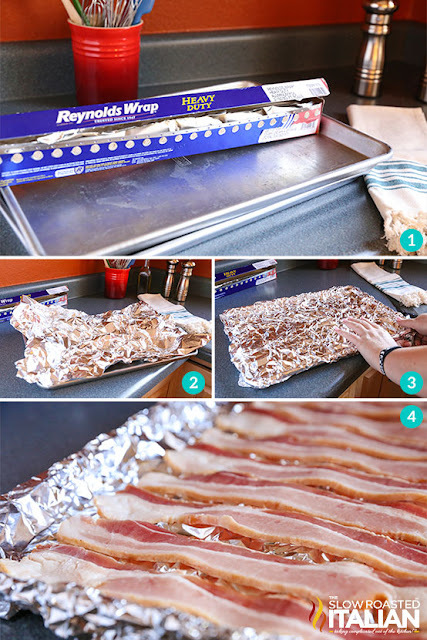 Lay bacon strips on top of foil. As you can see above the bacon lays across the little ridges. The bacon drippings will collect in the foil below the bacon (pretty smart, huh?). Do not lay strips on top of one another or they will not cook. When you are done (drain bacon drippings into a storage container if desired) and toss foil. Easy clean up. I used the rack method above for many years, then one day I had cookies cooling on the baking racks and wanted to make bacon. So, I tried other options. I tried baking it flat on parchment and foil. This resulted in a very greasy product, no matter how much I drained it or patted it with paper towels, the bacon was still greasy tasting. Then I found my favorite method. I still use the foil method outlined below, because it eliminates scrubbing that cooling rack. Which let's be honest I do not like doing dishes and scrubbing pots and pans is my least favorite. I am sure these methods will work for you too. Let me know in the comments how you cook your bacon. 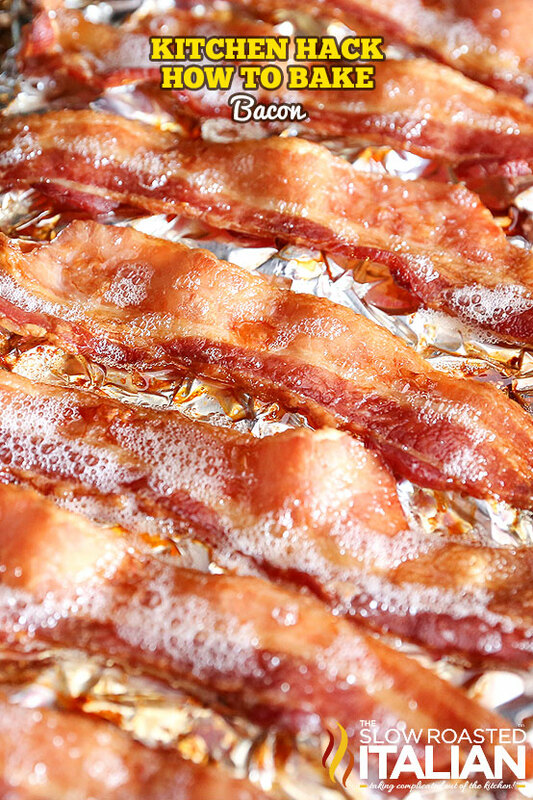 I always bake my bacon in a foil-lined pan, but never on a rack because I'd hate to have to scrub it afterwards. I'm going to try your crumpled foil method next time though! Thanks for all of your great recipes and ideas! I have used the first method but hadn't thought about the second method. Good one! I've been doing this for a couple of years. What I do is just bake it in a foil lined sheet pan. I let it cook in its fat then in the last 5 min or so I tilt the pan with a steel condiment cup and let the bacon crisp.. I don't like to waste the taste the fat gives. I don't understand how the bacon wouldn't be burnt to a crisp using the temp of 400. I have tried bacon in the oven numerous times and it has burnt even at 325. What am I doing wrong? to turn the bacon, but I have to or it will burn on the ends in my oven. I also don't preheat the oven. I put the bacon in a cold oven and then set it to 400°F (got that from the first baked bacon recipe I had come across years ago). I do about 12 mins before turning and then another 3-7 minutes depending on thickness and it's a perfect chewy-kinda crisp for us. I've cooked it this way for years. This is the method I use and it is successful every time. I don't preheat the oven and mine just right after 15 minutes. I dust mine with flour, no shrinking. I've used the foil lined pan method for years but crumpling is a great idea as well as dusting with flour. If you want to try a slice of heaven heat a 1/2 cup maple syrup in the microwave for 15-30 seconds and stir in a 1/4 cup brown sugar until disolved. 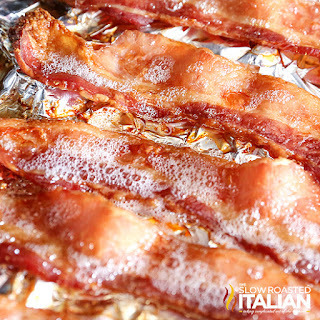 The last 5-10 minutes as the bacon is almost done drizzle or baste a little of this on each slice and finish baking. As you take it out of the pans place pieces on a platter don't put any paper towels under it and avoid overlapping any slices as they will stick to each other. WARNING; avoid sampling because if your like me it will ALL be gone before anyone else gets any of it! I cook my bacon on my Weber charcoal grill. Indirect heat and i place a pan underneath that I line with foil. I usually don't separate the slices. I had originally been introduced to this method using the 400 degree oven but found it very easy to overshoot and overcook the bacon. Then I came across directions that indicated 350 degrees. I've been using that lower temperature ever since with better results. I love it this way but it does make a mess on the oven walls. So your clean up is now cleaning the oven instead of a pan. 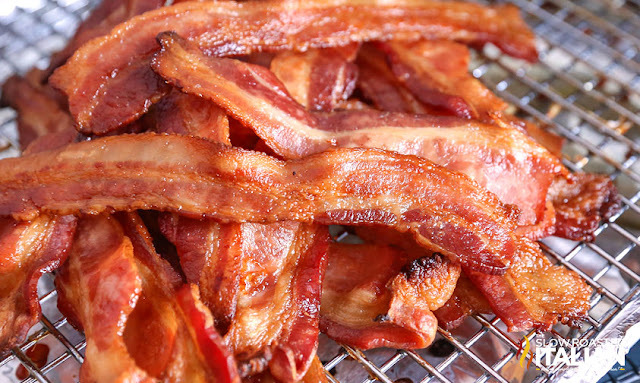 I used to oven bake our bacon...great for cooking tons of bacon for a crowd. But the "splatters" baked onto the walls of my oven and made it a huge mess. I don't bake it in the oven anymore. TY, TY for posting this! I had tried making my bacon in the oven but REALLY hated trying to get the rack clean afterwards, so I stopped doing it this way. Now, I can go back to baking it using the crumpled foil method. This will just make my cooking time so much easier! I have been baking my bacon this way for several years.....but I use the rack and have no problems cleaning it with a brush.....i also put the foil up the side of the pan so easy to pour into a container when done...no mess on pan. 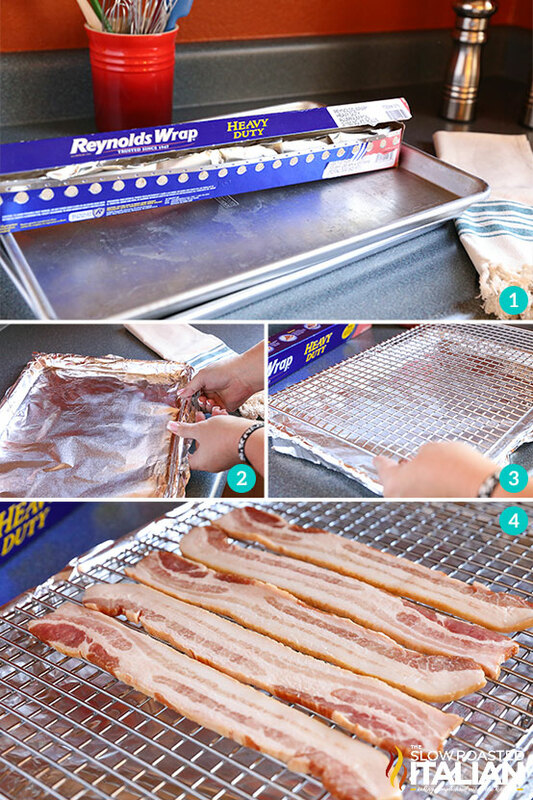 I used this bacon baking method with the rack on top of the foil-lined cookie sheet, and it was perfect! Thank you for a no-mess recipe for making bacon. One suggestion -- I could not find a search entry on your site in order to comment on this recipe. While your index of recipes is impressive, it took a long time to scroll through all of them to find this one so I could comment. Other than that 5 stars for this method! We are happy you enjoyed it!! There is a search bar on the top right, it says Recipe Search. Let's Eat! Hope this helps! I have been cooking bacon in the oven for more than 43 years I didn't realize it was not a commen practice. Have never had a problem with bacon spattering - But, for my oven (gas) I use 375 temp and opt for about 20-25 min thick cut bacon. Will have to try the crinkled aluminum foil - usually just put it on a rack in the half sheet pan. Doesn't require any big deal to clean it. But oven cooking is the way to go. And much less shrinkage and the bacon doesn't curl.